In the process of starting to roast my own beans, playing with the Aeropress, the Clever, and a number of additional coffee toys, I started to see the real limitations of my old Starbucks Barista espresso machine. 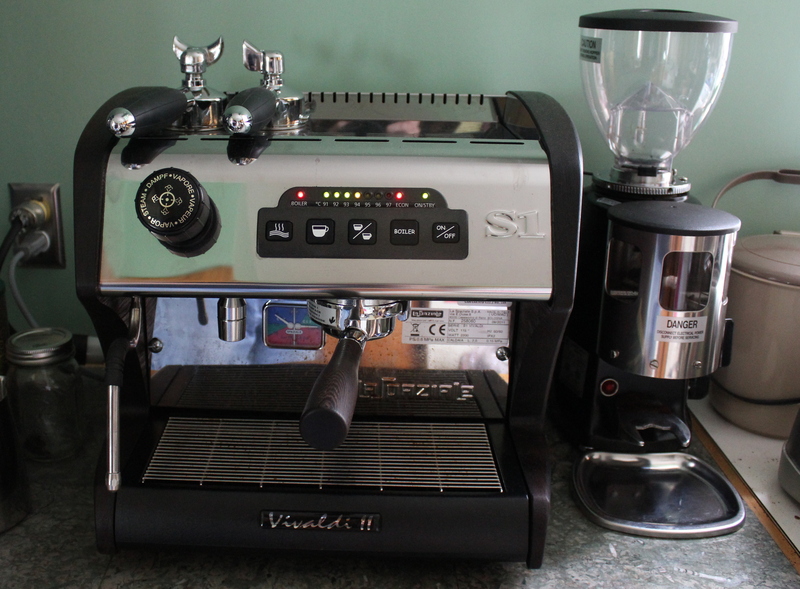 The Barista (also known as the Saeco Via Venezia) was a great entry-level machine. It has all the features one needs to get their feet wet with espresso, especially if they tend toward lattes, cappuccinos, or other milk-based drinks. The little guy had served me well for years, and I had gotten to the point where I could pull a “Not Terrible” shot, which I considered a near-ultimate victory. It was becoming clear though, that a really nice shot of espresso, as I was now able to appreciate and expect, wasn’t going to be happening. We have a major remodel planned for our home in the near future, part of which involves a new kitchen. We’ve been planning it for years, and now it looks like it’s about to happen. From the very dawn of the idea, I have planned to include a nice plumbed-in espresso machine on my own “Coffee Island”. So with the realization both that I had outgrown the Barista, and that the kitchen dream was now officially on the horizon, I started researching just what the next espresso machine to enter my home would look like. Living in the Pacific Northwest, great coffee and coffee equipment is never far away. A little internet research suggested that I would be looking for a double-boiler machine, preferably with an E61 group head and PID temperature control. The good folks at Clive Coffee were very helpful, and after a long and pleasant conversation, I found the machine I was looking for, the La Spaziale S1 Vivaldi II. My new La Spaziale S1 Vivaldi II and Mazzer Mini! To those who care, it doesn’t actually have an E61 or a PID controller, but the Vivaldi’s design largely eliminates the need for those things. At the time of my first visit to Clive’s showroom, the Vivaldi II was back-ordered from the manufacturer, and was at the very least a month away, and quite likely longer. As luck would have it, though, on my second visit to Clive Coffee, when I intended to order my new machine, something very unlikely happened: A bar that had opened only months before had gone out of business, and so this very gently used example of the Vivaldi II had come back on the market. The price was right, and Chris at Clive was able to hook me up with a nice deal on a Mazzer Mini grinder (when you’re talking espresso, the grinder is probably more important than the espresso machine), as well as the accessories I would need to get myself established as a working espresso geek. With all this, I still managed to come in under budget. The Vivaldi comes in two versions: the Mini, which has a vibratory pump and a water tank, and the standard Vivaldi II, which uses a rotary pump and needs to be plumbed in. Fortunately for me, my machine was still getting a thorough once-over and cleaning, so I had a couple of days to drill holes in my counters, cut pipes, and otherwise finish a plumbing project before I was faced with the sad sight of a very nice home espresso machine sitting helplessly on a counter top with nothing to do. As it turned out, it took a couple of hours, including shopping time, and all the parts were available at the hardware store around the corner. The daughter was extremely patient and helpful through this whole experience! After the hardware store, I bought her a blueberry muffin at the coffee shop down the street (I also had my symbolic last “commercial” latte). The Vivaldi also comes standard with a 20 amp electrical plug, which won’t fit into a standard US outlet, so I had to build a short adapter cable as well. There is a switch, accessible under the machine’s cup warmer that allows the user to switch between the standard 20-amp mode and a 15-amp mode for use with a standard receptacle. The new kitchen will, of course, have a 20 amp “home run” circuit with a 20-amp receptacle, so when the time comes, I’ll be switching everything back. By late Saturday afternoon, I was ready to pull a shot! The V-II takes about 25 minutes before the brew boiler and group head are at proper brewing temperature. I spent this time figuring out how the controls work, and doing some basic programming. I then had a few minutes to explore how the Mazzer Mini worked. This grinder is a serious piece of hardware! It’s got a great heft to it, and looks and feels just plain solid. I had a bag of espresso beans from my favorite local commercial roaster, and right off the bat, the Mazzer delivered a pillow of fluffy, uniform, fine ground coffee. To put it frankly, the first couple of shots sucked. I blame no one and nothing but myself. It took me a couple of tries to figure out at the most basic level just what I was doing. I quickly realized that my ability to get a “Not Terrible” shot out of the Barista had everything to do with having used that particular machine exclusively for so long, and nothing at all to do with having any general (real) barista skills whatsoever. Then, after about the fourth or fifth try, something happened.